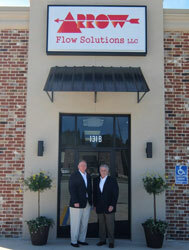 Based in Hammond, Louisiana, Arrow Flow Solutions (AFS) provides a full range of integrated solutions for difficult and demanding hydraulic and pneumatic applications. From instrumentation and hydraulic tubing to the tools needed to fabricate complete systems, AFS delivers a quality offering of diversified products and installation solutions. Corrosion resistant Tungum tubing has been proven to deliver safety critical, long lasting solutions in demanding environments across the world.